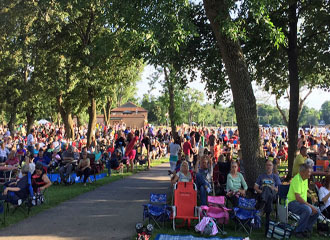 We look forward to your visit to Main and West Beaches for the 2019 Beach Season! A handicapped beach wheelchair is available at both Main Beach and West Beach. Please contact Main Beach Office for further information. 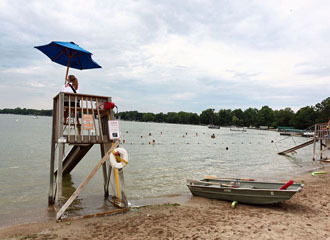 You may also notice that after heavy rainfall, the beaches may be put on "Swim Advisory." 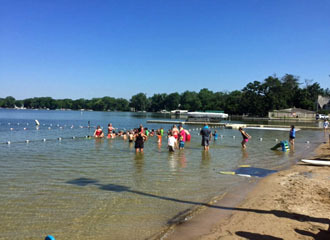 The water is OK to swim in, but swimmers should be aware bacterial quality levels could be elevated. 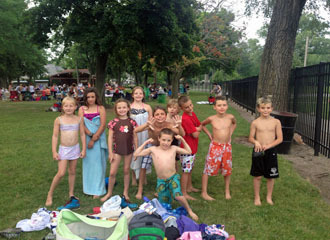 We are in constant communication with the McHenry County Health Department to ensure we are communicating with swimmers. 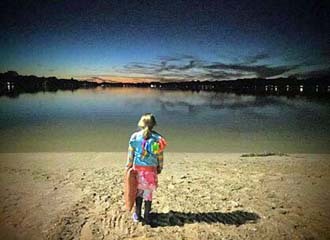 When the water is deemed unsuitable for swimming, the beach will be closed. The water will then be re-tested everyday by the Health Department until we can reopen. Stay up-to-date on beach closures by subscribing to our Rainout Line. 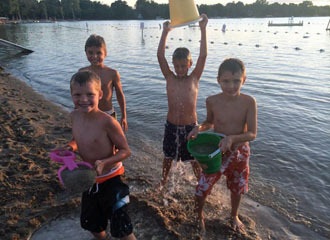 View beach updates from McHenry County Department of Health. 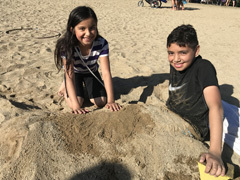 Beach Passes are available at the Administration Office beginning May 1, or at Main and West Beach during summer operating hours. 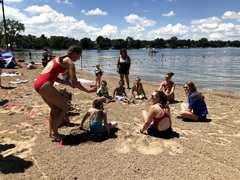 Beach Passes are for beach use only and do not include the boat launch, boat rental, program or special event privileges. Beach Passes do not include entrance of guests. 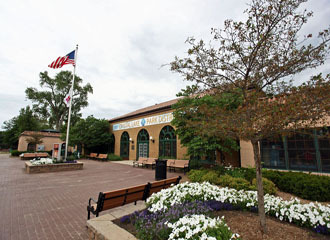 Please note: A current photo ID with a Crystal Lake Park District address must be presented at time of purchase. A current utility bill with address may also be required. All beach pass holders will receive exclusive savings including free boat rentals, guest passes and more! 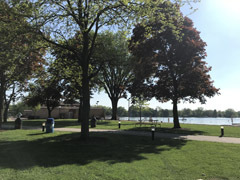 Beach Passes are available at the Administration Office beginning May 1, or at Main and West Beach during summer operating hours. 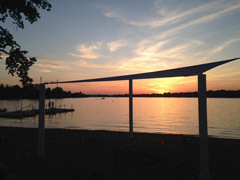 Beach Passes are for beach use only and do not include the boat launch, boat rental, program or special event privileges. Beach Passes do not include entrance of guests. 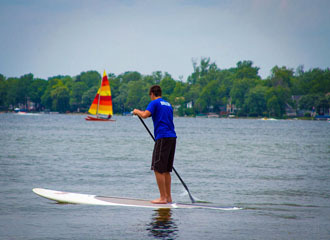 All season pass holders will receive half-off boat rentals Monday-Friday at Main Beach. Pass holders must show season pass at time of rental purchase to receive discount. 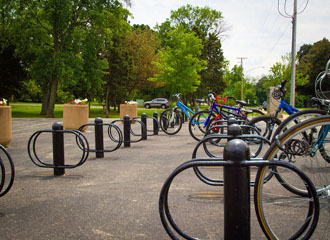 A lock-up area for bikes is provided at Main and West Beaches. A handicapped beach wheelchair is available at Main Beach. 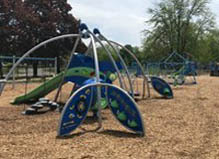 Please contact the Main Beach Office (815.477.5404) for further information. 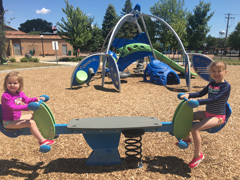 Subscribe to the Lake Lines Newsletter! 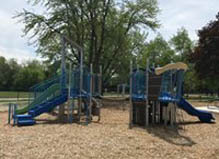 Just enter your email address and then select Lake Line Newsletter. 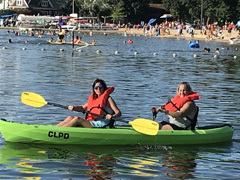 Boating on beautiful Crystal Lake is fun and affordable through the Park District boat rental operation at the Main Beach Boat House. Fees are on a per boat basis. 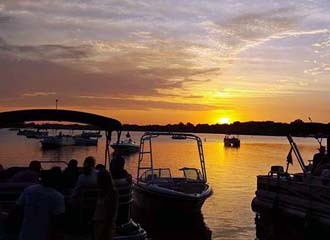 All renters must sign a Boat Rental Waiver. Available at Boathouse or print in advance (see link below). 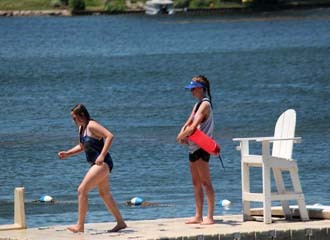 12 - 15 year olds may use boats with a signature of a parent/guardian who is present on the beach. 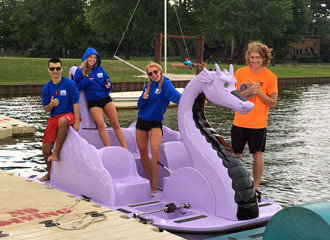 16 - 17 year olds may use boats with a signature of a parent/guardian. 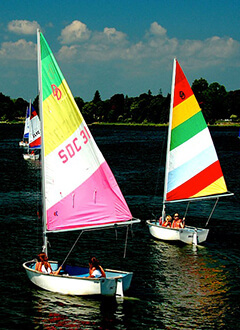 * To rent a sailboat, you must present a Park District sailing card, which can be obtained by taking our sailing program, or one from another reliable organization. 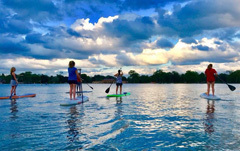 ** Half price, per hour, if rented for a minimum of 4 hours. 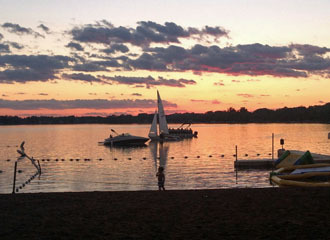 During the summer season, the Crystal Lake Park District offers Private Sailing Lessons and Group Sailing Lessons. 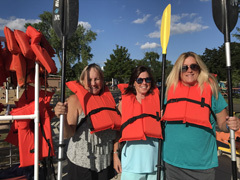 Email Heidi Stolt for questions about Sailing Lessons. 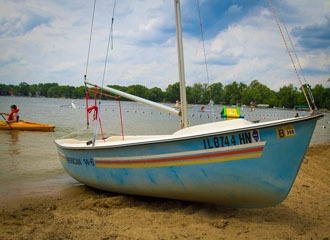 Anyone wishing to rent sail boat from the Crystal Lake Park District Boat House must present a sailing card from a Crystal Lake Park District course, or another reputable organization. 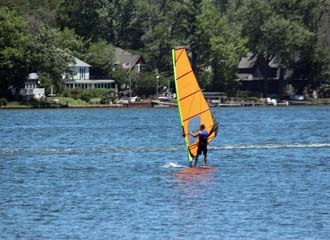 Sailors may also present ownership papes of a sailboat to rent a boat on Crystal Lake. Passengers do NOT need to present card, only person sailing. Enjoy the carefree life of a sailor! 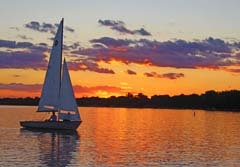 We provide the boats, lifejackets, sailing partner if needed, and expert instruction. 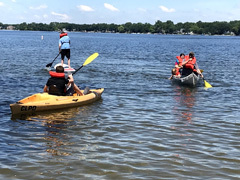 Upon completion of this class, students must demonstrate the basic skills and knowledge of sailing to receive a Park District Sailing Card, which is required for renting sail boats on Crystal Lake. Water shoes and beach attire are required. To schedule lessons, first complete the Private Lesson Request Form and submit at least one week in advance of your preferred start date. 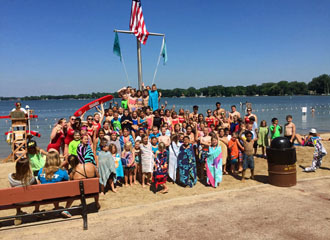 For additional information, contact Heidi Stolt at hstolt@crystallakeparks.org. 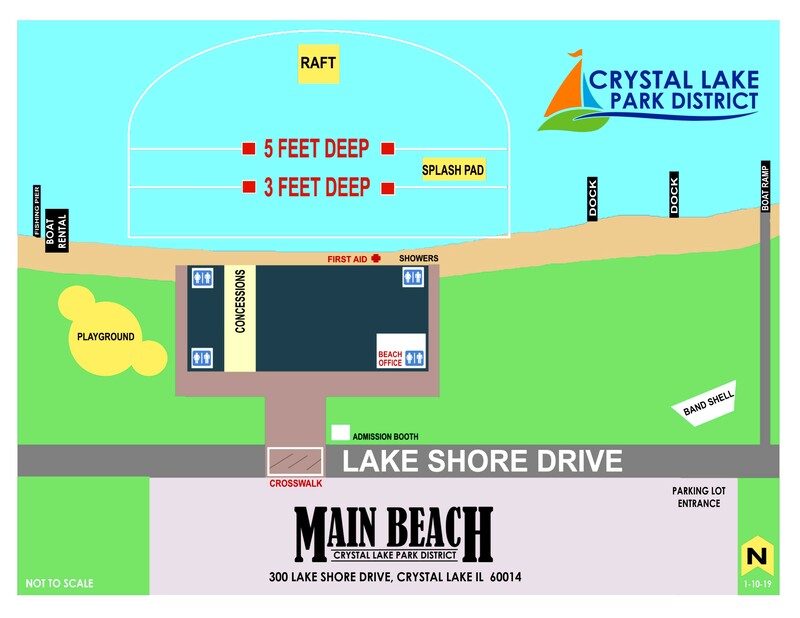 All residents of the Crystal Lake Park District are eligible to boat on Crystal Lake. See Boat Gate Card information below. 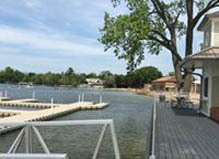 The Village of Lakewood and the City of Crystal Lake have a joint agreement for regulating and patrolling the lake. 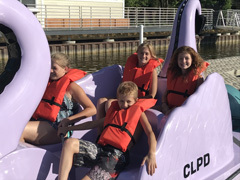 A copy of the Crystal Lake Boating and Safety Regulations as put forth by the Village of Lakewood can be found at the Village of Lakewood website. 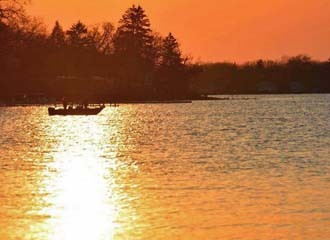 Crystal Lake boat owners living on the lake may contact the Park District Administration office to arrange for a one time boat launch access to put their boat in for the summer season and a one-time boat launch access to remove their boat at the end of season. Front gates will open at 9 am. No one is allowed to reserve tables until after 9 am. Items on tables before 9 am will be removed. 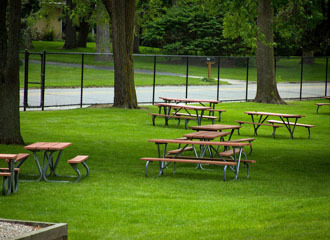 For everyone's safety, picnic tables are not to be moved to another location of the park. 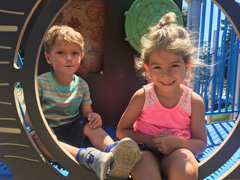 Regular admission applies until 2:30 pm. Starting at 2:30 pm, admission is $3/person. 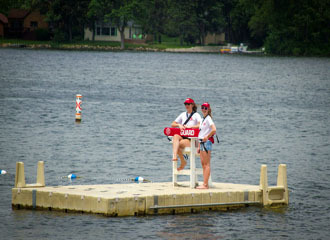 No parking in the Main Beach boat launch area until AFTER 11 am. Please park in the far back of Main Beach lot along the grass. 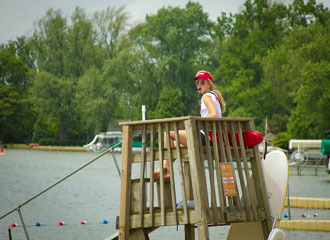 Registration for the Regatta will be taking place from 9 am - 11 am. 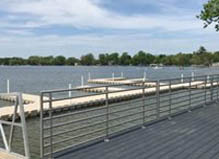 Participants will be using the boat launch parking area to register and check-in their boats. Please try to avoid the launch during this time as it will be busy with registration. 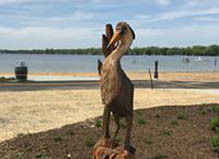 West Beach launch will not be effected by this event. 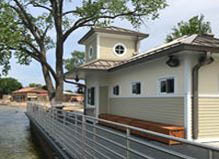 The Park District has 18 boat stalls available for rental in the West Park dry storage compound. Registration for dry storage spaces begins April 1. 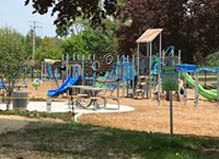 Stalls will be leased on a first-come, first-served basis. 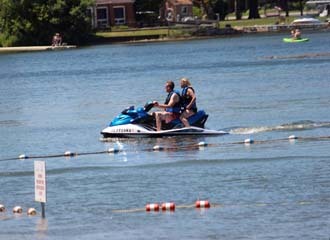 Watercraft may be stored beginning April 1, and must be removed from storage on or before October 25. Applies to a resident family that is bringing in other resident families and non-resident guests. 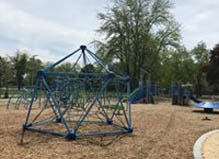 Guest under 3 years of age and over 60 years of age will receive free admission. Picnic tables are on a first come first served basis. 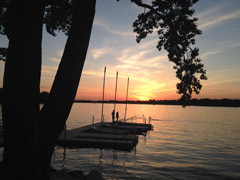 **all staked tents require (5) day advance permission from Crystal Lake Park District staff due to limited areas that can accommodate stakes in ground. 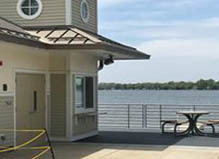 Guests may rent the Main Beach Pavilion or Band Shell for their special occasions. 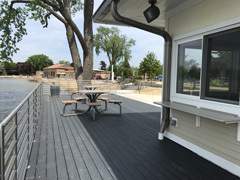 The Pavilion features 72" round tables, air temperature control, wood floors and LED light display. 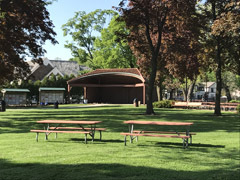 The band shell, nestled among the big oak shade trees on the north end of the park, provides the perfect backdrop for your event. 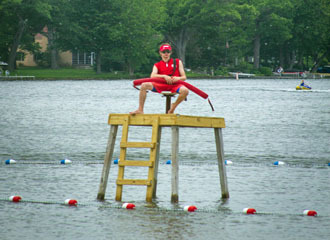 No one may enter the water without a lifeguard on stand. 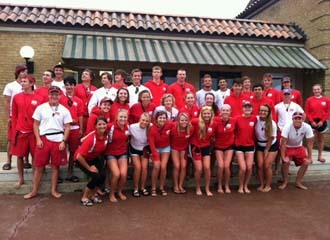 Swimmers must follow lifeguard's instructions. Swimming alone is prohibited. Persons under the age of 11 must be accompanied by a responsible person 16 years of age or older. 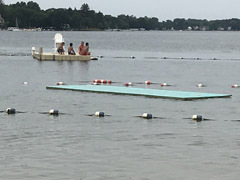 Swimmers must stay within the roped off area. Red buoys indicate water over 3 feet deep. 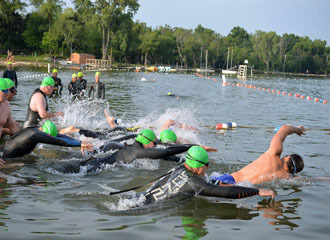 Swimmers in deep water must be able to swim without assistance. Children who are not toilet-trained shall wear tight fitting rubber or plastic plants. All swimmers must wear proper swim wear. No street clothes allowed. 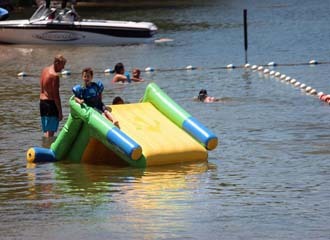 Floats and other inflatable devices must be U.S. Coast Guard approved and not allowed past the red buoy line. 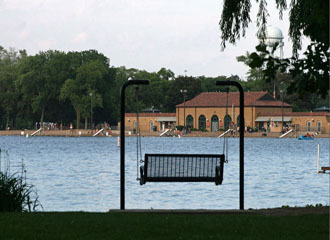 The lake water is not suitable for drinking. 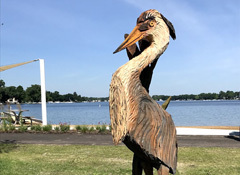 Avoid swallowing lake water. 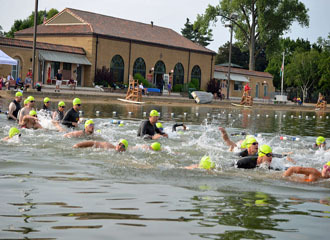 It is recommended that swimmers shower and towel dry after leaving the water. 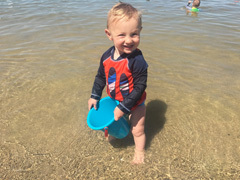 Admission to the beach may be refused to all persons suspected of having contagious diseases or infectious conditions. 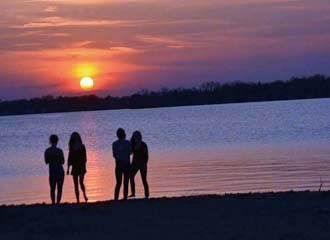 Admission to the beach may be refused to any person under the influence of alcohol or exhibiting erratic behavior. Littering is prohibited. No food or drink is permitted in the water. Glass containers of alcohol are not permitted on the beach or swim area. 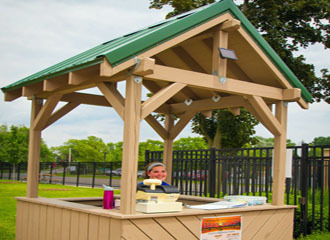 Patrons are encouraged to protect themselves from sun exposure. Patrons are to conduct themselves on the beach and in the water in such a manner as to not jeopardize the safety of him/herself or others. 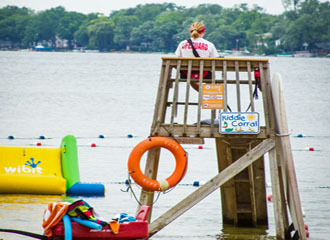 Beach staff has the authority to implement and enforce rules that are stringent or that supplement those listed here. 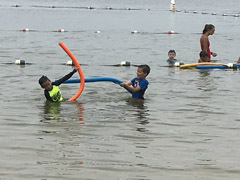 Flagpoles located at Main and West Beaches carry color-coded weather flags to inform boaters about weather conditions. To help ensure your safety, please learn the meaning of the following flag colors and make it a habit to look for them while on the lake or at the beach. Green: Fair weather, light air, wind 1-10 m.p.h.